Eyed these models up several times in the past, thinking I might use them in a diorama, basically just wanting them because they looked like nice sculpts. Picked the up finally because I reasoned that I could use them as objectives, or even civillian/recce incidental characters, and I’m not sorry, they really are lovely. As someone who is primarily a painter, (and lets not forget before i go on here, a proficient 3D modeller) there is just something about the quality of the sculpts of the old hand sculpted models that the new digital sculpts haven't got to the level of yet. don't get me wrong, there some nice design work coming out of the new 3D process, but the feel, and the depth of sculpt and the tactile quality of the planes and nuance of the surfaces just isn't there. Couldn't agree more. Most CAD sculpts just seem to be lacking soul or depth. Far too clinical. As someone who has seen the technology develop, and teaches 3D modelling it actually has me wondering how much is a limitation of the technology and how much is a limitation in the operators, we teach our students traditional sculpting as well to help their understanding, and if these guys haven't had that type of training it might explain some of the shortcomings in dynamism etc. of course there is no way to find out the answer to that as whenever i ask anything at open days about the process you come up against the "are you a competitor" suspicion and they wont answer you lol. Yup - even I can pick up on such subtleties! A great choice of models, mate. 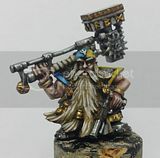 Agreed and your painting does them justice as well. Ah - finally ninja'd by Ackland - thats what you get when you go away for a few days. Heartily agree on the hand sculpt v 3D stuff - particularly the early 3D stuff GW put out - very much simple shapes lacking soul. I have these two kicking around on a shelf somewhere - much the same reason - they were too cool not to find a use for somewhere. Nice work as always mate - well done picking out the glowing end of the cigar! These are wonderful additions to any collection and I love what you've done with them. I've been following your blog for a few years and I was just wondering if you would be interested in joining the Wayland Games Affiliate Program? You deserve a little recognition for helping the world wide wargaming community with all your painting. And we can help you to fund your hobby. Any questions, just message me back.